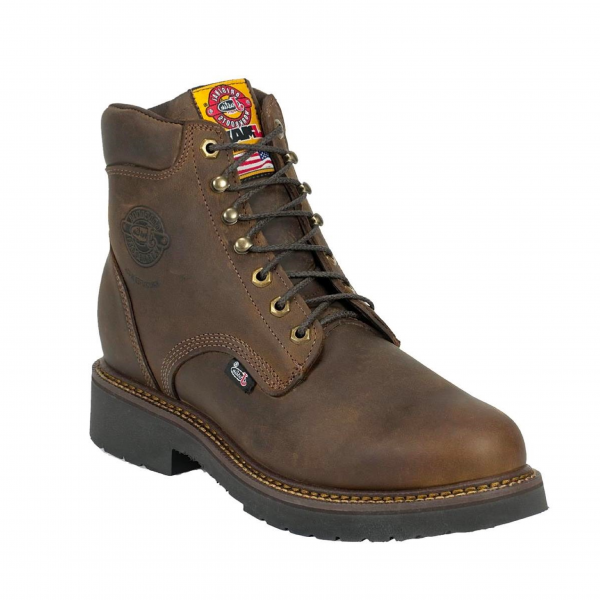 The Balusters Bay Steel Toe 6, 6-inch tall J-Max® men’s lace-up work boot features a golden brown leather exterior crafted for durability and a steel toe for ultimate protection on the job. It’s built for comfort with the J-Max® Double Comfort System® that utilizes a mesh spacer footbed cover that provides extra comfort and a healthy environment for the foot and the J-Max® removable orthotic inserts with J-Flex Flexible Comfort System® with Justin Jel® offer a multi-density foam cushion that absorbs initial impact and provides energy return as you walk. The encapsulated air cells virtually eliminate compression set so the bounce of cushioned energy return is present for the life of the boot and the strategically placed polyurethane gel pads in the heel arch and ball areas reduce muscle fatigue for unparalleled comfort. This boot also features the Dri-Lex® cooling system that pulls moisture from the inside of the shoe, leaving the insole dry and cool as well as a durable dual-density polyurethane slip resisting outsole. Meets ASTM F2413-11, I75, C75 EH safety footwear standards.